Q: What do we supply? A: A venue of your choice. We have screened in many different settings including school halls, sports halls, community centres, hotel function rooms and even a church! Q: Why are your costs not displayed on your website? A: Our costs vary depending on a number of variables such as travel time, travel costs, number of screenings etc. Please contact us for a quote. Q: Explain the fundraising elements involved? A: Your audience pay an admission fee to see the movie. In addition to this, each of your cyclists will be required to raise sponsorship. Furthermore, your local business community will have the opportunity to advertise at the event through a range of unique and eye catching promotional opportunities. Please contact us for further details. A: Contact us to determine our availability on your chosen date. If it is available we will require a booking deposit to fully reserve the date for you. The deposit is 50% of our fee and payment can be made by credit card on our website or alternatively by either cheque or bank transfer. The balance of payment is due on the day on completion of your event. Q: How big does our venue need to be?/ How much space does your equipment take up? Q: Do you provide sponsorship cards & promotional posters? A: Yes our costs are inclusive of sponsorship cards, A3 and A4 promotional posters. We also provide flyers outlining the advertising opportunities available at our events allowing you to maximise business advertising revenue. Q: How many cyclists do we need? A: The more cyclists you have the better as each one will be required to take a sponsorship card and be encouraged to fundraise. It is best to change cyclists over at least every 20 mins. Movies are typically about 100 minutes duration meaning you will need to change your cyclists at least 5 times. The system has 8 bikes so you will need 40 (8 bikes x 5 changes) cyclists minimum but you should allow for some substitutes. However if you have a larger pool of available cyclists you could reduce the cycling shifts to 15 min rotations meaning you would need to change your cyclists 7 times. In this case you would need 56 cyclists (8 bikes x 7 changes) but again should include some substitutes. Q: Do all 8 cyclists change at once? A: No, we change out one cyclist at a time to maintain sufficient power in the system. It takes 1 -2 minutes to change out all 8 cyclists. Q: Is it difficult to cycle? A: No it’s not difficult but you will feel some resistance due to the system’s electrical load requirements. The bikes all have gears so you just need to select the most comfortable gear as required. A: Children would need to be a minimum of sixth class age. At this age there would need to be a ratio of 5 adults to 3 children to maintain power levels where they need to be. The bikes are too big for younger children and they won’t have the stamina to sustain their effort over 15 – 20 mins. Q: Can you screen movies that are currently in the cinema? Q: Do you do outdoor screenings? A: No, indoor only. We don’t do outdoor screenings because of the unpredictable Irish weather and also the high cost of outdoor screening licences which prove prohibitively expensive from a fundraising endpoint. A: It takes approximately 4 hours to unload, set up and test the equipment prior to show time. Q: What insurance cover do you have? Q: How big is the cinema screen? 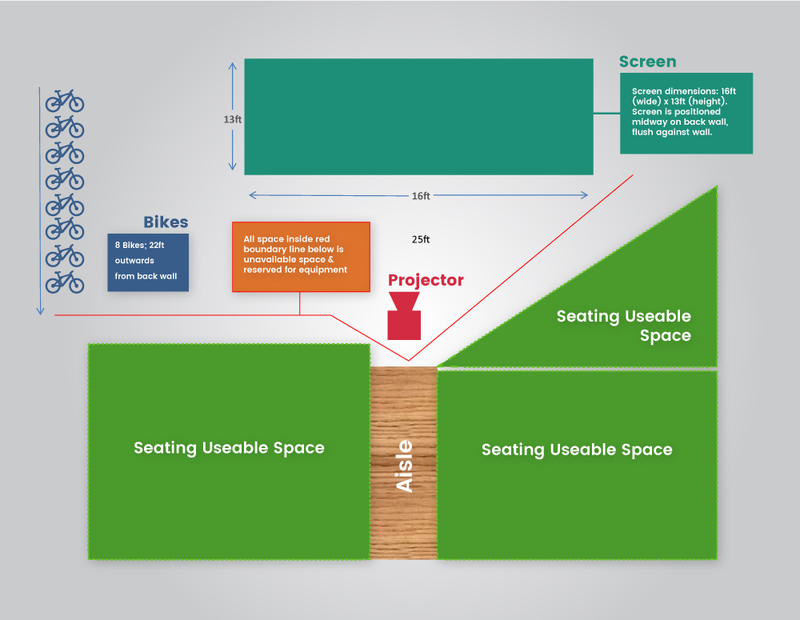 A: The viewable screen size is 16 foot x 9 foot (W X H). The screen is supported on 4 foot high legs giving the screen a total height of 13 foot. Please check that your venue has a 13 foot clearance from floor to ceiling. Q: We have a stage in our venue; can we put the screen on the stage? A: For insurance reasons we are required to keep the screen at ground level only. Q: Do we need to black out the windows in our venue? A: Yes, you will need to black out the windows to prevent ambient light from infiltrating and saturating the image on the screen. The darker you can achieve the better the viewing experience. Heavy black cloth or sections of heavy black plastic usually work well for this purpose. 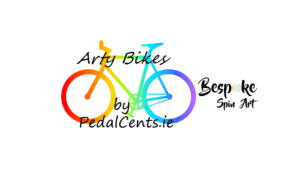 Q: Why should I choose Pedal Powered Spin Art for my event? A: It is so much fun, people of all ages are mesmerised by our spinning art drums! You may be a school or club looking for an activity with massive appeal to improve your next family fun day, sports day, 5K/10K etc. You can decide whether to use it as a fundraising opportunity or not. For registered charities, our novel art activity may help you to reach a new audience or at least distract the kids long enough to be able to pitch your charity’s cause to the grown-ups! For the corporate sector we believe our Pedal Powered Spin Art is perfect for staff family fun days, team building events, product launches etc. A: Our costs vary depending on a number of variables such as travel time, travel costs etc. Please contact us for a quote. Q: Can you run Pedal Powered Spin Art outdoors? A: Yes we can set it up as an outdoor activity. You will need to provide some form of cover such as a gazebo, marquee etc. in case of rain. Q: Will I get splattered with paint? A: Not at all. Our paint drums are quite deep and are designed to prevent any paint spray coming into contact with you as you paint. A: About 10 – 15 mins. The idea would be that you would put your name on your painting and leave it with us to dry and then return to pick it up. Q: What age group is it suitable for? A: Aged four and above. For small children (4 – 6 years) we provide a footstool to stand on as they paint if required. Q: How long does it take to create a spin art painting? A: It takes about 30 seconds to create a unique piece of art. A: In the case of children it is usually a parent, guardian, older sibling or friend. Q: What do you provide? A: We provide 4 x Pedal Powered Spin Art stations and all the paint and paper that you’ll need. We set up the equipment for you and our crew will man the stations for a full or half day as required. Q: Why should I choose VÉLOCITY – The Ultimate Pedal Power Challenge for my event? A: Our VÉLOCITY Challenge is the ultimate crowd puller! Everyone loves a fun challenge and the chance to impress in front of friends and family. VÉLOCITY is a fascinating spectacle for observers of all ages as the participants furiously battle to outmanoeuvre their opponents. You may be a school or club looking for a new fundraising activity or searching for an add on activity to a family fun day, 5K/10K race etc. Why not boost your event’s appeal by getting us on board. For registered charities, VÉLOCITY is a perfect activity to pull a crowd, allowing you to present your cause to a captive audience. As a corporate body you may be looking for fun team building events, novel opportunities to entertain clients or energetic activities for your company’s family fun day? Perhaps you need a unique activity for a new product launch? If so then we can help. Q: How long does each challenge last? A: We can vary the length of the challenge as required but 20 second challenges work well. Q: What is the minimum age requirement for participants? A: Participants would need to be 8 years and above to take part in the challenge. Q: Can the system be adjusted to suit varying ages, sizes and abilities? A: Our bikes are fully adjustable in terms of saddle height. Also the duration and difficulty level will be selected to match the participants as appropriate. A: We provide 4 x VÉLOCITY Challenge stations. In addition we will set up the equipment for you and our crew will man the stations for a full or half day as required. Fundraising for your School, Club or Charity ?